Meigs junior awaits a pitch during the Lady Marauders’ 10-0 victory over Crooksville in a Division III sectional semifinal contest on May 8 in Rocksprings, Ohio. Four athletes from the Ohio Valley Publishing area were named to the Southeast Ohio Division III all-district softball teams for the 2018 season, as voted by the coaches within the southeast district of the Buckeye State. Meigs had four selections, with three of those being recognized as first-time recipients of all-district honors in softball. 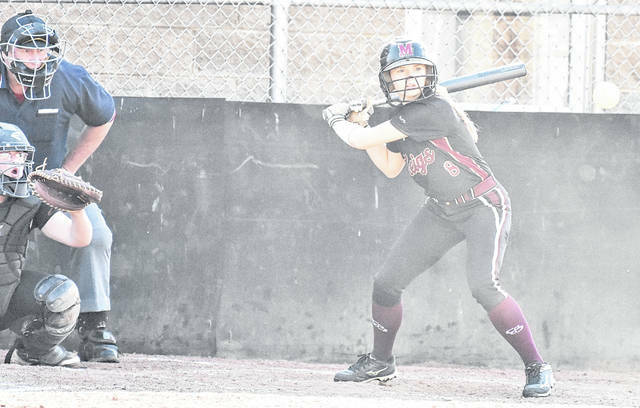 MHS junior outfielder Taylor Swartz — who was the lone repeat selection — was named as a first team selection in Division III. Senior first baseman Peyton Rowe was joined by sophomore pitcher Breanna Zirkle and freshman shortstop Jerrica Smith as honorable mention selections. The Lady Marauders finished the season with a 12-8 overall record and were second with a 9-3 record in the Tri Valley Conference Ohio Division before falling to Alexander in the D-3 sectional final. The Wheelersburg duo of Boo Sturgill and Teresa Ruby were respectively named the D-3 player and coach of the year. Boo Sturgill, Wheelersburg; Brooke Webb, Chesapeake; Kasey Murphy, Coal Grove; McKenzie Cremeens, Ironton; Caitlyn Brisker. Oak Hill; Kaiti White, Fairfield Leesburg; Abby Howard, Alexander; Emily Robinson, Westfall; Zoe Doll, Minford; Cameryn Alexander, Piketon; Grace Stevens, Rock Hill; Christen Risner, Wheelersburg; Kylee Kellough, Huntington; Andrea Edmisten, Eastern Brown; Taylor Swartz, Meigs; Ashley Compston, Wellston; Laiken Rice, Northwest; Jacqueline Bautista, Portsmouth; Abby Stark, Adena; Brittani Wolfenbarker, Minford. Morgan Fridley, Fairland; Sammy Tatman, Ports. West; Ayzia Fullen, Westfall; Evia Bennett, Zane Trace; Syanne Conley, Huntington; Lauren Crum, Coal Grove; Ryeigh Swann, Chesapeake; Hannah Morgan, Lynchburg Clay; Laney Eller, Wheelersburg; Olivia Anderson, North Adams; Lyndee Spargur, Fairfield; Rylie Hughes, Oak Hill; Whitney Broughton, Eastern Brown; Addison Newman, North West; Sara Allen, South Point; Mary Beth Burton, Ironton; Makayla White, Ports.West; Kendra Coleman, Wellston; Darby Minor, Westfall; Jadyn Mace, Alexander. Alexis Lute, Northwest; Jaclyn Burchett, Northwest; Jordan Storms, Chesapeake; Erica Bowman, Chesapeake; Marcy Dudgeon, Westfall; Gracie Smith, Piketon; Kalesie Henderson, Piketon; Madison Metzger, Piketon; Braidon Collins, Huntington; Brody Entler, Huntington; Keiara Conwell, South Point; Serah Whitrace, Lynchburg; Kailey Adkins, Oak Hill; Andrea Lewis, Oak Hill; McKenzie LeRoy, Crooksville; Logyn Chamberlin, Crooksville; Alannah Williams, Crooksville; Lacie O’Neal, Crooksville; Riley Shreck, Ironton; Peighton Rowe, Ironton; Britteny Koewler, Eastern Brown; Allison Malott, Eastern Brown; Jerrica Smith, Meigs; Breanna Zirkle, Meigs; Peyton Rowe, Meigs; Adrianna Hoffman, Fairland; Emily Bowen, Fairland; Libby Judge, Fairland; Madison Harper, Rock Hill; Rileigh Morris, Rock Hill; Kylee Howard, Rock Hill; Jade Johnson, Adena; Megan Peek, Adena; Sarah Clanon, Wheelersburg; Desiree Ison, North Adams; Carly Phillips, North Adams; Gracie Hill, Alexander; Erin Scurlock, Alexander; Caitlyn Holdren, South Eastern; Stacia Francis, South Eastern; Jess Bolte, South Eastern; Maddie Baeter, South Eastern; Kaylea Cooie, Zane Trace; Alexis Guffey, Zane Trace; Emilee Wilson, Zane Trace; Gracie Riley, Coal Grove; Lauren Meyer, Coal Grove; Erica Scott, Wellston; McKenna Kilgor, Wellston; Madison Cochran, Ports. West; Taylor Coleman, Ports. West; Taylor Shockey, Nelsonville-York; Kimberly Jones, Nelsonville-York; Skylar Riffle, Nelsonville-York; Hannah Tolle, Minford; Emily Shoemaker, Minford; Lauren Arnold, Fairfield; Carli Reiber, Fairfield.